Stony Brook University is doing its part to prepare young people for careers in health care. The Health Sciences Center of the university is hosting the Health Careers Opportunity Program (HCOP), a six-week summer program funded by U.S. Department of Health and Human Services for students who have completed their junior year of high school. 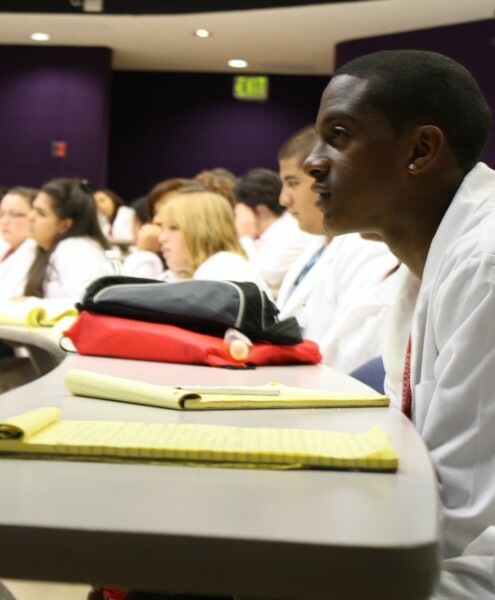 The mission of HCOP is to help prepare under-represented students for careers in the allied health professions, which are clinical health care professions separated from dentistry, medicine, and nursing. This is the second year of the three-year project and it will meet July 5 through August 12, 2011. All of the participants are students of four school districts: Amityville, Brentwood, William Floyd in the town of Mastic Beach, and Wyandanch. The selection committee of HCOP was very careful in choosing its participants. Out of over 200 applicants, only 73 students were accepted, and requirements included a completed application, interview, and recommendations. Dr. Vidal also stressed that there are two dimensions to the schedules that the participants follow during the program. There is academic instruction from professors to boost their knowledge and study skills in English, science and math, and there is the hands-on clinical work which exposes student to the allied health professions engaged in laboratories. “I used to think about a doctor’s office which is boring, or it made me think of the ER where the patient’s life is literally in your hands when you have to perform surgery. I really didn’t want to do any of that stuff, but now I know more about the health professions and how different professions work together to solve a problem,” remarked sixteen-year-old Lorenz Roberts, a student from Brentwood. One of the major goals of HCOP is to use its participants as ambassadors to their communities through the dissemination of health information. The students prepare information on topics such as distracted driving, bulling, gang violence, and scholarship, which will be distributed to their school districts. Participants are paid a $40 stipend for each day they attend HCOP. “We felt that this would be an opportunity for student to be engaged, to consider this a very serious opportunity to pursue. For some of these young people it’s very difficult to earn money so this was another incentive. This was like a job so getting them prepared for that they have to come here every day and to show up on time. If they don’t come on time they get a dock on their pay,” Dr. Vidal explained. “Honestly I don’t really care about the salary because, regardless of the salary I’m getting, I’m serious about health professions and it’s something I’m set on doing. I have that goal set in mind, so the salary doesn’t matter. It’s just an extra,” said Luis Pioquinto, 17, a participant from Amityville. As a part of the college preparation aspect of the program, HCOP uses Method Test Prep, an online SAT preparation program. It includes explanations, immediate feedback, and strategy guides for each part of the exam. Ian Berry, Brittany Garguilo and Stephanie Maldonado contributed to this article.